What leads one down the path to being sinister? Maybe it was spending one too many nights, staring into the deep, never-ending darkness, or maybe someone just took the last donut on the wrong morning… As an infamous jokester once said, madness is like gravity all it needs is a little push to start down a path of destruction. Whatever drives one to that kind of unyielding madness, it's always nice to have an outfit that matches the mood. 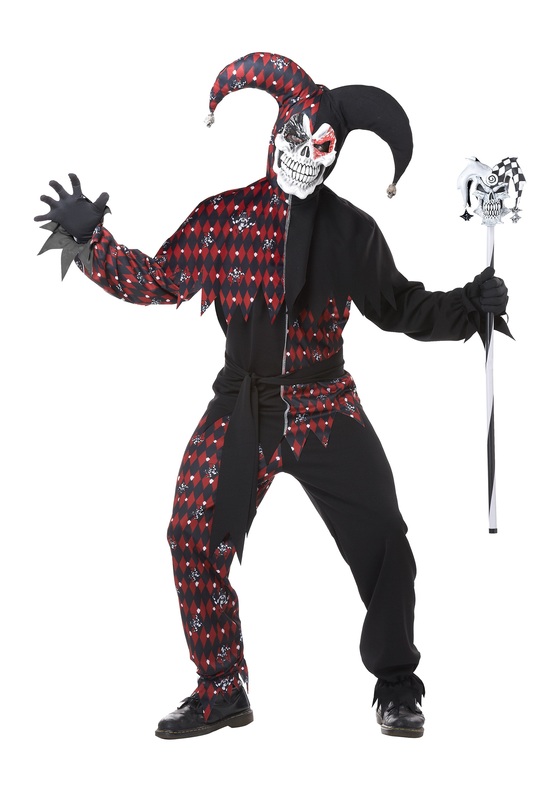 When you walk around in this Sinister Jester Costume everyone will know, that despite being completely sinister, you still enjoy a good laugh or two. Be a reminder to everyone this Halloween that one cannot spell “slaughter” without “laughter”. If you have a pretty dark sense of humor that other’s describe as sick, morbid, or sinister, then this is the costume for you. You’ll look as if you crawled out of the depths of the darkest nightmares and had a jolly ole time while doing so. While others may be walking around with horrific costumes of monsters, nothing will be as terrifying as you. It’s something about a demonic face with a hellish smile… it’s quite unsettling and sticks in one’s mind like gum on the bottom of a shoe. Take things to the next level this Halloween when you enter the party scene as this Sinister Jester. Just make sure to have some killer jokes and a few magic tricks that are to die for!